Life has found a way to survive in some of the most extreme conditions imaginable. Now, scientists believe they might have found a new habitat for hardy microbes — inside garnets. New research found unusual patterns of tunnels in Thai garnets with deposits of fatty acids in the burrowed pathways, indicating a microbe caused the damage. Magnus Ivarsson, lead researcher on the study at the University of Southern Denmark, said the research started with an exchange student from Thailand who was studying the gem quality of the garnets. She discovered the tunnels that branched and changed directions, unlike previously described environmental weathering, and consulted Ivarsson. "When I first saw these structures, these tunnels, I was sort of intrigued by the complexity of them," Ivarsson told VOA. "I have previously studied other microbial boring in minerals and materials, but I've never seen anything with this complexity." The garnets are an unexpected habitat for microbes because of their hardness. In fact, according to Ivarsson, this is the hardest mineral yet discovered to be bored by microbes. "Who knows what we'll find next. Maybe a diamond bored by microbes. Who knows?" Ivarsson said. Researchers are careful to point out that no living organisms were discovered within the gemstones. Dawn Cardace, a researcher in the department of geosciences at the University of Rhode Island, studies how geology and biology interact. She told VOA that while this study didn't find any DNA of the organisms, "This wasn't troubling to me, largely because they chose to work with the sample set they have at a very close, submicroscopic scale." She said they would have needed at least a thousand gemstones in order to collect a DNA sample. The researchers relied on several technologies to come to their conclusions. First, the scientists used microscopy to make 3D maps of the tunnels on the scale of microns. 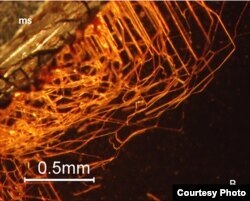 A human hair is about 50 microns wide, but the tunnels in the garnets were generally smaller, hence the need for high-powered microscopes. The scientists focused on how the tunnels spread and changed directions, and when they converged at crossing points called "anastomosis." Although environmental weathering can cause cracks and fissures in hard minerals, Ivarsson said weathering processes can't explain the complexity of the tunnels they observed. The second step to demonstrate that microbes most likely created the tunnels required analyzing the interior of the boreholes. "The organic content tells us that there's been life living in there," said Ivarsson. In particular, they detected lipids and fatty acids, which are organic compounds common among bacteria and fungi. Ivarsson and his colleagues compared these biological traces to hematite and quartz grains found in the same location as the garnets, in the river sediment of the Chiang Mai stream. Neither of the comparable stones showed signs of fatty acids, indicating the biological traces were unique to the garnet tunnels. When asked about the results, Ivarsson said, "At this point we can say at least that biology has been involved. I would suggest that it's fungi that has been involved in this. But at the same time, I think we should be really cautious because there might be other processes [at work] that are not known today." Cardace agrees that while microbes were certainly living inside the gemstones, further research is needed to prove how the tunnels were created. She said she would like future studies to show "a set of experiments done with candidate microorganisms that could do the metabolic work" the researchers proposed in their paper. Ivarsson and his colleagues did, however, consider why microbes like fungi might be making the garnets their home. They sampled garnets from river sediment in Thailand, as well as within granite upstream. Ivarsson told VOA, "When we studied these garnets in the granite, we could see that there were no tunnels. But when we looked at the garnets further down the river, we could see that these tunnels structures had evolved. So, something happened along the way, along the transport in the river system." The researchers argue that the microbes bored into the garnets while they were in the river bed. Microbes in the sediment of the river lack access to chemical energy sources like iron, which is contained in the garnet crystals. Perhaps, researchers propose, the microorganisms created the filaments within the gemstones to access this resource. Such changes to the garnets, however, decrease the value of the stones. Shane McClure, global director of colored stones at the Gemological Institute of America, told VOA that when it comes to determining the value of garnets, "If there's only one or two [tunnels] and they're very small, it doesn't affect the value at all. But if there's a whole bunch of them and they're very visible, well then it's going to affect it quite a bit from a gemstone perspective." These gemstones might not be usable for flashy jewelry, but they do demonstrate that life finds a way in all sorts of inhospitable and unexpected locations. As Ivarsson told VOA, "When we look for life on Mars, we need to know what to look for. And this is one type of biological signature that is definitely interesting in the search for life on Mars or any type of extreme environment."